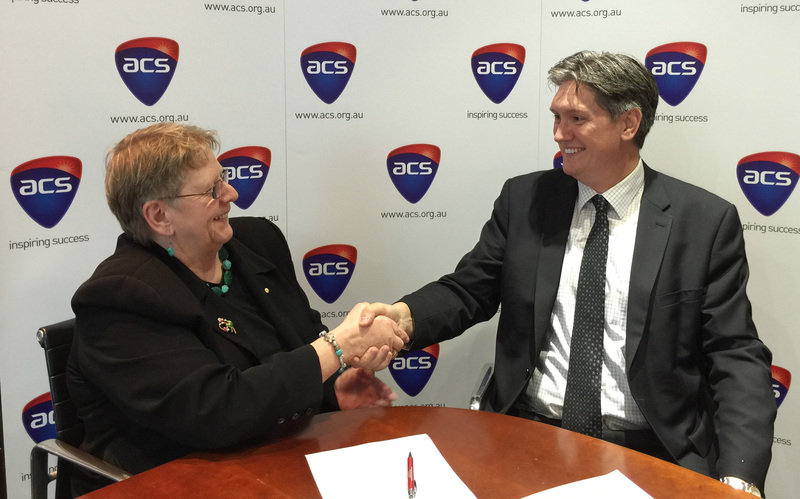 5 December 2014: Australian Computer Society (ACS) President Brenda Aynsley OAM today announced the appointment of current ACS Chief Operations Officer Andrew Johnson to the role of Chief Executive Officer. Ms. Aynsley also paid tribute to CFO Kim Finch, who has held the role of CEO whilst an executive search was undertaken. Andrew Johnson has extensive senior management experience servicing both the higher education and VET sectors, including in membership based professional associations. His career has seen him work in a diverse range of markets across the Asia Pacific region. In his time at the ACS he has delivered significant growth results in the SFIA and education space, all while improving member engagement, particularly among professional partners. He was instrumental in the development of the organisation’s current three-year plan and product offering. Mr Johnson holds a Masters degree in Technology Policy and Management, He is an ACS Certified Professional and an accredited MySFIA Consultant. “It’s a great honour to be able to lead an organisation like the ACS” Mr. Johnson said. “With the incredible growth of the digital economy, the ACS will continue to be a trusted source of knowledge for the Australian ICT sector. That we can do this is a testament to our staff, volunteers and members. I look forward to working with them all in the coming years to keep up the great work done so far”. Kim Finch will remain in the role of ACS CEO until December 31. Mr Johnson will commence in his role from 1 January 2015. The Australian Computer Society (ACS) is the professional association for Australia’s Information and Communication Technology (ICT) sector. Over 20,000 ACS members work in business, education, government and the community. The Society exists to create the environment and provide the opportunities for members and partners to succeed. The ACS strives for ICT professionals to be recognised as drivers of innovation in our society, relevant across all sectors, and to promote the formulation of effective policies on ICT and related matters. Visit www.acs.org.au for more information.